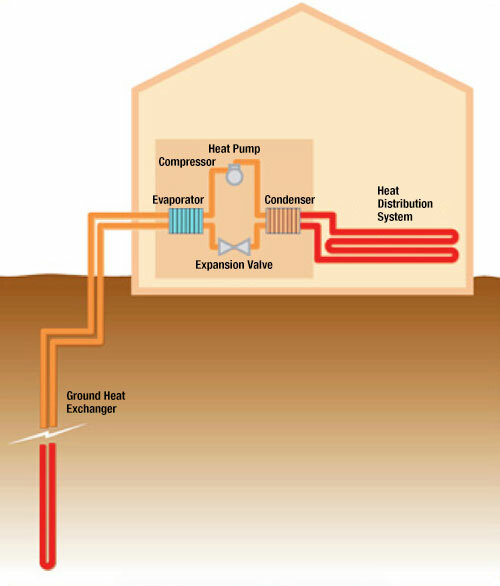 Ground source heat pumps (GSHPs) use a loop of pipe buried in the garden which extract heat from the ground. They circulate a mixture of water and antifreeze around the loop of pipe (a ground loop), which absorbs heat from the ground, this then passes through a heat exchanger into the heat pump, and from there into the heating and hot water circuits of the house. The cooled ground-loop fluid then passes back into the ground where it absorbs further energy from the ground in a continuous process as long as heating is required. The ground stays at a fairly constant temperature under the surface, so the heat pump can be used throughout the year. The length of the ground loop depends on the size of your home and the amount of heat you need. Longer loops can draw more heat from the ground, but require a larger garden. Normally the loop is laid flat or coiled in trenches about two metres deep, but if there is not enough space in your garden you can install a vertical loop down into the ground to a depth of up to 100 metres for a typical domestic home. Heat pumps have some impact on the environment as they need electricity to run, but the heat they extract from the ground, the air, or water is constantly being renewed naturally.